Situated near the James River in Richmond, Virginia, the 1717 Innovation Center is a contemporary reflection of its industrial neighborhood. 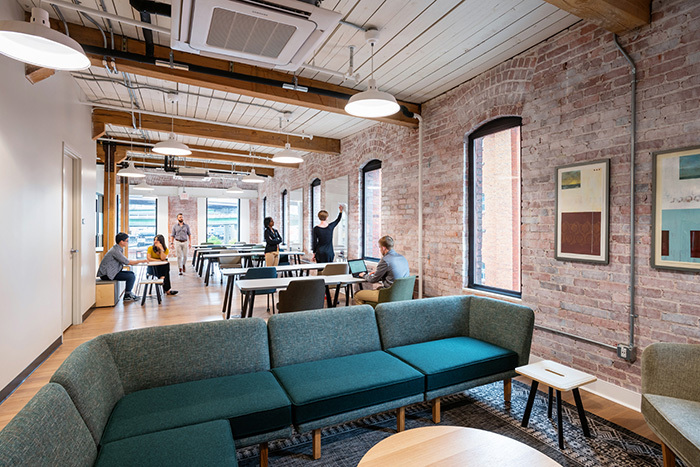 Continuing the revitalization efforts in Richmond's downtown, the former tobacco warehouse features lofty ceilings and an open plan, resulting in a one-of-a-kind space that benefits the local community. The 1717 Innovation Center is a multi-purpose space housing over 50 startup companies and a unique office for Capital One. As a new venture for the firm, Capital One sought to build a co-working space to support and encourage innovation. In addition to a consumer testing lab, the design brief stipulated open workshop space, as Capital One teams from the West Creek campus, near Richmond, would co-locate here to focus on specific projects. Due to the volume and diversity of activities, flexibility and ease of reconfiguration were important design drivers for Capital One. The building’s other occupant is Startup Virginia (SVA), a non-profit organization dedicated to supporting and growing startup companies in the Richmond area. SVA complements its co-working space with an ongoing program of guest speakers, educational sessions, and business coaching from volunteer mentors. With a target of 50 companies and 75 mentors, SVA exceeded expectations, admitting 58 companies and over 100 mentors by the grand opening. The building’s six floors are planned and programmed according to occupancy requirements. The first three floors, occupied by SVA, are built to accommodate participating start-ups as they develop and grow. The ground floor is made up of unassigned, open co-working space, and features a large amphitheater for SVA’s frequent presentations and programs. 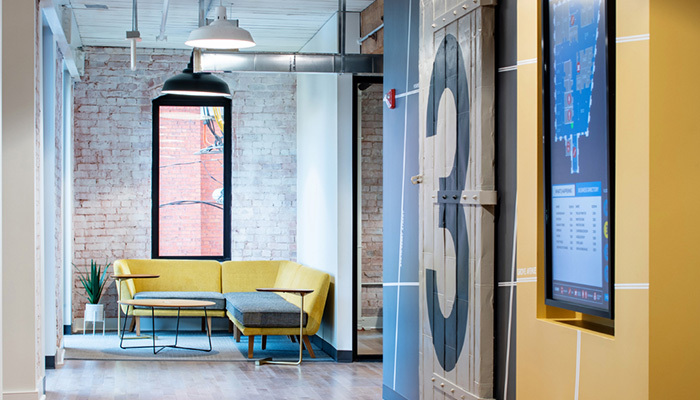 The second floor allows for open, assigned team spaces, and the third floor consists of leased offices for larger companies on the verge of expanding past the accommodations of the incubator. The fourth floor offers shared conference space for both SVA and Capital One. It also features a Capital One user experience testing lab, which has an additional welcome lounge adjacent to the elevator. Each floor, while having a different purpose, encompasses the core drivers of providing hospitality as well as offering various shared spaces for meeting, working, eating, and socializing. The sixth floor incorporates a large meeting and training room with a bar for catering and events, as well as a rooftop deck. This space is available by reservation to outside community groups, and serves as a tool to integrate the greater Richmond area with occupants of the Innovation Center. 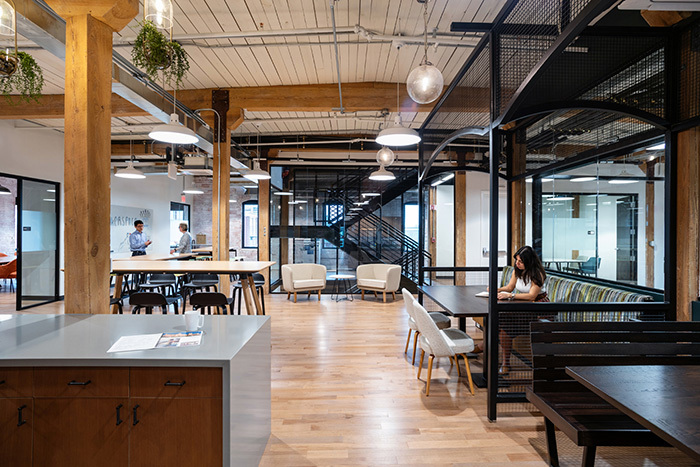 To realize this shared vision, Capital One chose local architecture and design firm SMBW. Familiar with the Knoll commitment to creating innovative and creative workplaces, SMBW suggested a strategic partnership between Capital One, the project principals and Knoll. Given the need for the space to adapt to constant change without compromising performance, it was clear that the planning requirements would be best served with an Immersive workplace— a highly flexible and fluid space. Together, the team—Capital One, SMBW, and Knoll– agreed to partner to build an innovative workplace that encourages shared learning, collaboration, and exploration. Leveraging Knoll research on co-working and incubator spaces—which reveals that employees are not only spending more time in group work, but that the time is largely impromptu—the 1717 Innovation Center provides opportunities for casual collaboration, fosters creativity, and supports employee engagement. 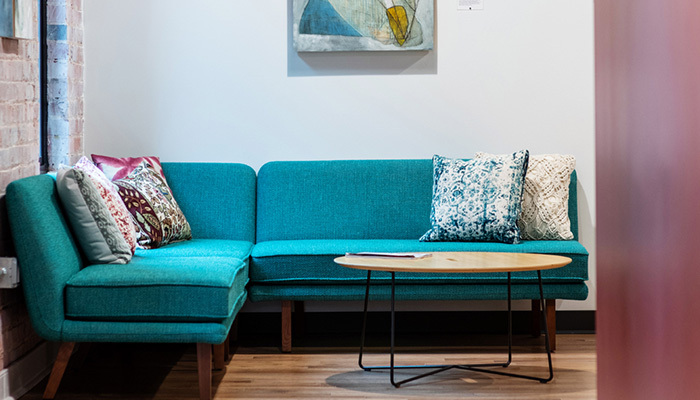 The Innovation Center implements these forward-thinking concepts, paying particular attention to wellbeing, flexibility, hospitality, and a balance between individuals and teams. The Innovation Center integrates the precepts of Immersive Planning, offering solutions for ultimate flexibility and quick adaptability, as well as various horizons that create different planes for interaction throughout the space. In addition, the designers honored the site’s origins and history, reusing materials whenever possible and recasting the building’s architecture as essential design elements. To support the goals and creative vision of the space, the project utilized all elements of the Rockwell Unscripted™ collection from Knoll: tables, seating, lounge, borders, storage, and accessories. Writeable surfaces support brainstorming and processmapping, and are included throughout the building in both fixed and mobile applications.